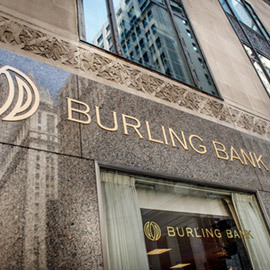 Founded in 1989, Burling Bank is a full-service, privately owned retail bank located in the heart of Chicago’s financial district. Burling Bank offers a full suite of banking products and services to meet the deposit and credit needs of our clients and the community, while providing direct access to the Bank’s decision makers. Our personalized, responsive approach to banking allows us to remain focused on, and committed to, the individual needs and success of our clients. As an independent community bank, we provide the flexibility, access, and responsiveness that our clients deserve, allowing them to choose how they wish to bank – from one-on-one conversations with a longtime personal banker to the ease and convenience of mobile banking. Quite simply, community banking is about client relationships. Burling Bank was founded on the desire to provide a higher level of personalized customer service and to treat all clients with discretion and respect. We are grateful for the opportunity to deliver on this promise for twenty-seven years and we look forward to a strong partnership together.